Golden House is a domestic violence program and shelter that works toward a violence-free community through personal, social and institutional change. Golden House knew Strawberry Fields Design was the perfect design partner for their Beatles-themed event. 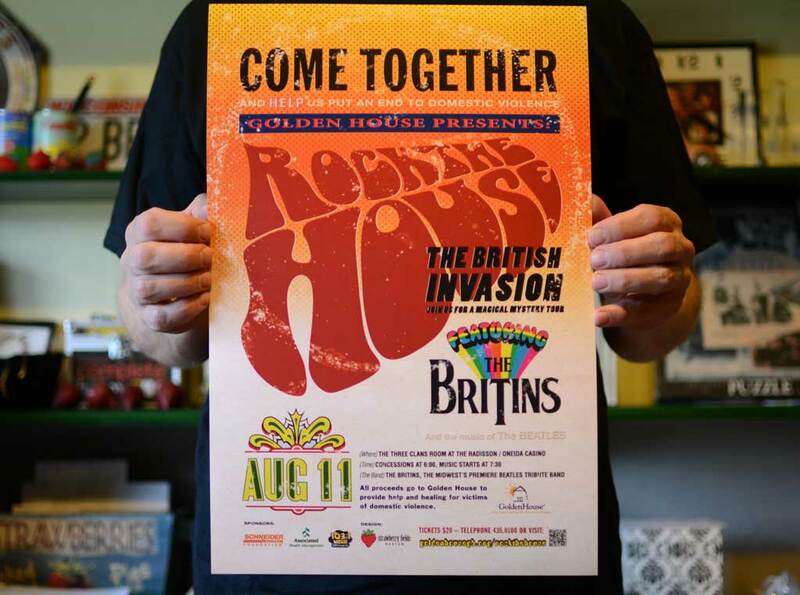 We worked with the organization to create poster, ticket, and t-shirt designs for its Rock The House fundraising event. The poster design is primarily typographic, and features type and design elements picked from a wide span of album covers including “Meet the Beatles,” “Help,” “Magical Mystery Tour,” “Sgt. Pepper’s Lonely Hearts Club Band,” “Yellow Submarine,” “Revolver,” “Rubber Soul,” “The White Album,” and “Past Masters.” See if you can find them all! Print Graphic Design Services: Event poster design. All contents © Strawberry Fields Design, Inc. All rights reserved.